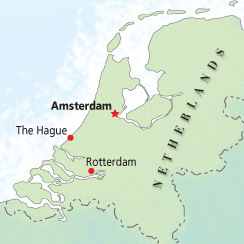 Fifty years ago this month, the first stake in the Netherlands, the Holland Stake, was organized in The Hague. It was the first non-English-speaking stake in the Church. One hundred years earlier, in August 1861, Paul Augustus Schettler and A. Wiegers van der Woude were the first missionaries to preach the gospel in Holland. Over the next 100 years, more than 14,000 people in the Netherlands were baptized, many of whom emigrated to the United States. Today nearly 9,000 members live in the Netherlands. On September 8, 2002, President Gordon B. Hinckley (1910–2008) dedicated The Hague Netherlands Temple, which serves five stakes and one district in the Netherlands, Belgium, and part of France.